Nic Gonzalez, lead singer of the Christian band Salvador, is framed by a sea of light on-stage at ROCK. In the Gospel of Matthew, Jesus said to Peter, “Upon this rock I will build my church.” (16:18). 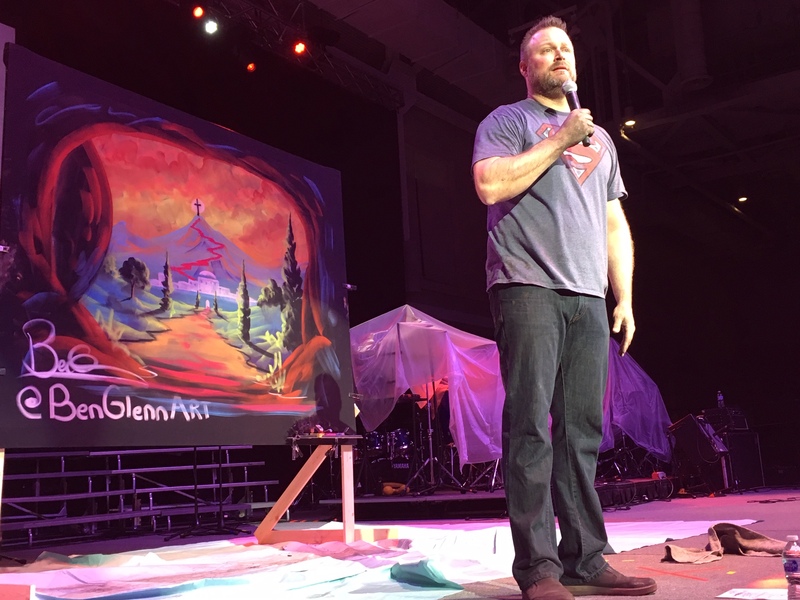 For the last 25 years, thousands of youth and their leaders have gathered from the Baltimore-Washington Conference for a weekend retreat that’s all about experiencing God’s love and what being a “rock for Christ” means. 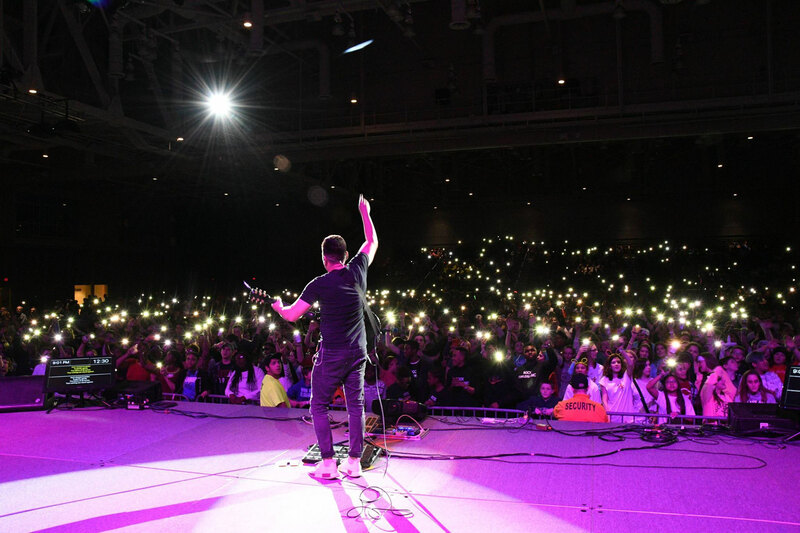 ROCK, held Feb. 8-10 in Ocean City, Md., saw more than 4,000 youth and adults gather for sessions of lively worship and praise, motivational speakers, fantastic art, and opportunities to grow deeper in a relationship — or make a first-time commitment — to Jesus. The band Salvador brought praise and worship music for ROCK, which again saw hundreds of youth rush the stage to dance and sing along. 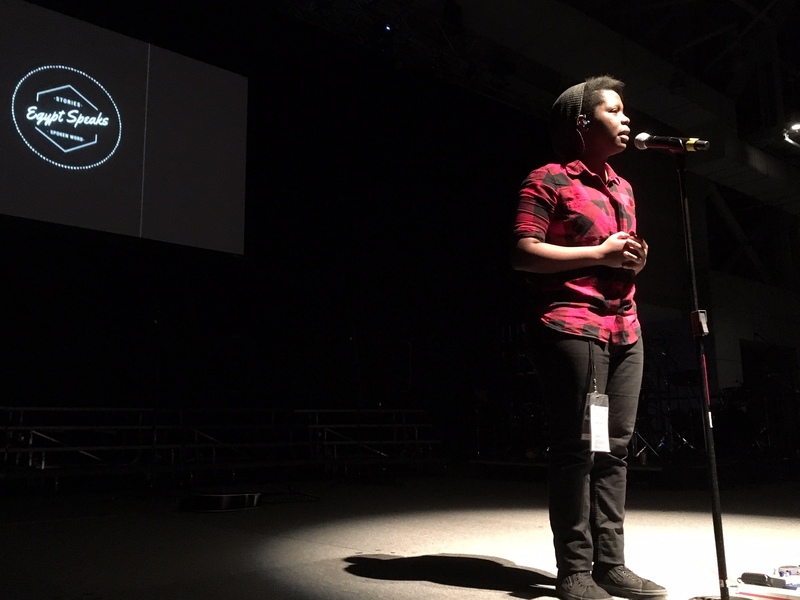 A spoken word poet, Egypt Speaks, shared her truth over eight chapters in four sessions. “You are worthy, and you are worth it,” she said, offering insights from her own life. God knows our mistakes, Speaks said, and knows our confessions of sin. And God, she said, still loves us. Glenn said that he, along with Salvador and Egypt Speaks, all came together at ROCK to soften up hearts to let God do what God does best. ROCK started as an event in the old Washington West district in 1994. After out-growing several venues, it moved to Ocean City in 2001 and took over the convention center. An estimated 65,000 youth and adults have attended ROCK since 1994, Price said, and it’s known but to God how many additional lives have been touched by those people. 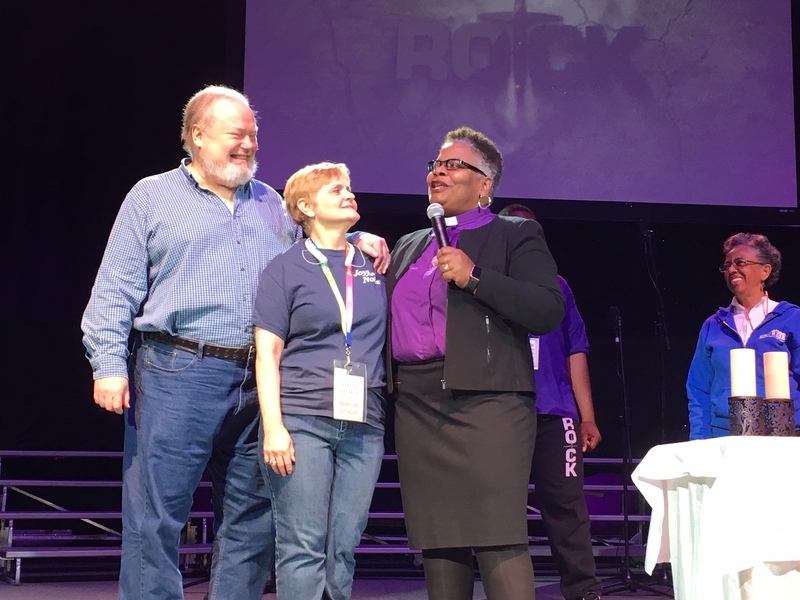 Tom Price, Becki’s husband and also a long-time leader of ROCK, joined her on stage Sunday morning after Communion, as the ROCK Mass Choir performed two songs. The pair were honored by Bishop LaTrelle Easterling and other leaders of ROCK for their long-time service. ROCK also isn’t just a weekend for the youth; it’s a weekend by the youth, Price said. There’s a leadership team for ROCK, and it’s the youth on that team that select the Scripture and the theme for the event. They also select the speaker, vote on the band, and then we narrow the speakers down from a handful, Price said. That final list gets sent to Bishop Easterling for her to review and to say what she would prefer. The annual offering at ROCK went to support Retreat and Camping Ministries in the Baltimore-Washington Conference by providing money for "camperships" -- scholarships to help defray the cost of attending a week of camp. The offering this year was $11,697.76.